Looks like a leprechaun has left you a bit of gold at the end of this rainbow! If you need a cute and simple treat for St. Patrick’s day then I have one that is perfect for you. This sweet and lucky treat will leave everyone’s Irish eyes a smilin’ whether they be a wee lass or wee lad. 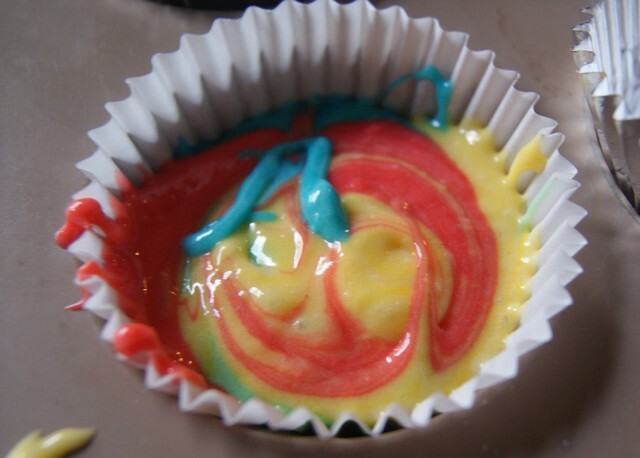 An easy way to use up some cake mix that may be in your stockpile, but still inexpensive even if it’s not- they are a great treat if for your little ones class party, to pass out to neighbors, or family. This is also a great project for the kids to help out with, other than the oven, they will be able to take part in all other aspects of preparing and decorating. These rainbow cupcakes would be a fun surprise for your child to find in their lunchbox on St. Patrick’s day as well! Prepare the cake mix per the directions on the box. Divide equal amounts of batter into 4 bowls. We used red, yellow, green, and blue food coloring until the desired color was reached. 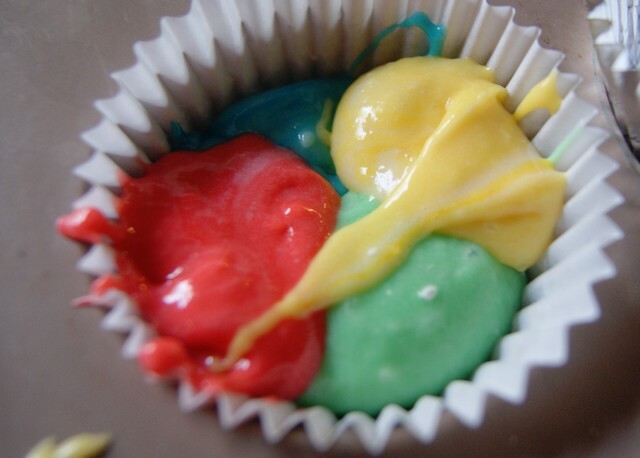 Then place cupcake wrappers in a muffin tin and fill 2/3 full, a teaspoon at a time, alternating colors. Bake per directions. Allow to cool. Scoop 1-2 tablespoons of white frosting on top of cupcake. Finish off with a chocolate gold wrapped candy coin. 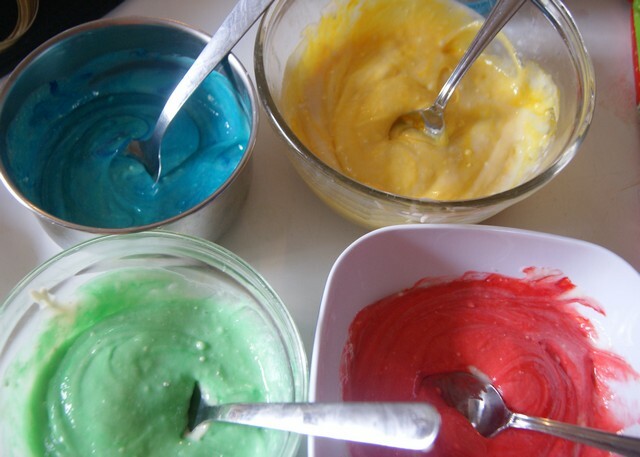 Divide equal amounts of batter into 4 bowls- add red, yellow, green, and blue food coloring into each until your desired color is reached. Scoop 1-2 Tbsp. 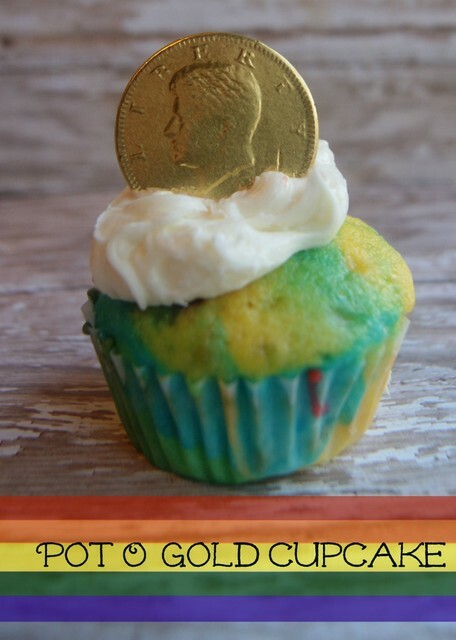 of white frosting on top of cupcake, and finish off with a chocolate gold wrapped candy coin. This rainbow cupcake is great for St. Patrick’s Day. My kids would be impressed by its colors so they can’t refuse to help me out. Thank you, Briana! This is super cute! Not only do they get a cupcake but they get a surprise on top as well! Thanks for linking up with Delicious Dishes Recipe Party! These are so cute and perfect for St. Patrick’s Day! Pinned, tweeted, and shared. Thank for sharing at Merry Monday, hope to see you again next week!